This book, as the title implies, is an introduction to Transfigural Mathematics. It covers the philosophical foundations of transfigural mathematics which involves amongst others, the exploration of what it means for one to be a flow in the other. 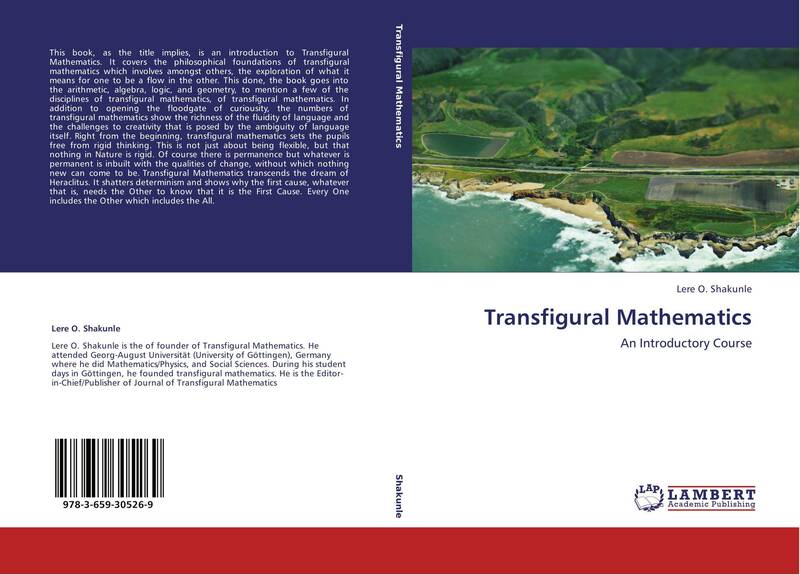 This done, the book goes into the arithmetic, algebra, logic, and geometry, to mention a few of the disciplines of transfigural mathematics, of transfigural mathematics. In addition to opening the floodgate of curiousity, the numbers of transfigural mathematics show the richness of the fluidity of language and the challenges to creativity that is posed by the ambiguity of language itself. Right from the beginning, transfigural mathematics sets the pupils free from rigid thinking. This is not just about being flexible, but that nothing in Nature is rigid. Of course there is permanence but whatever is permanent is inbuilt with the qualities of change, without which nothing new can come to be. Transfigural Mathematics transcends the dream of Heraclitus. It shatters determinism and shows why the first cause, whatever that is, needs the Other to know that it is the First Cause. Every One includes the Other which includes the All.